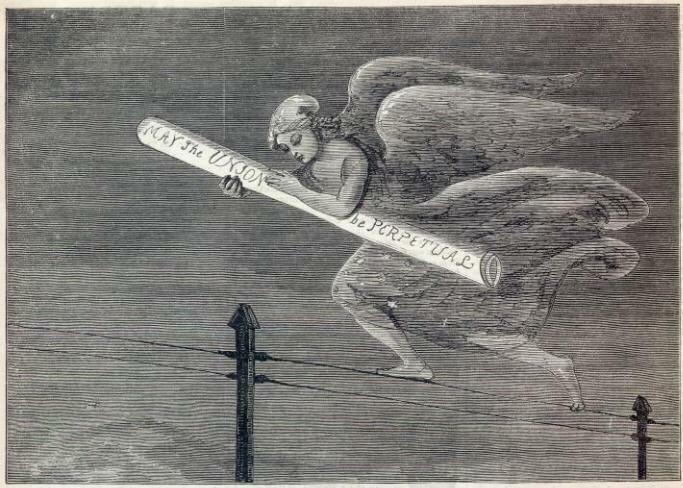 Nestled on the back page of a November 1861 edition Harper’s Weekly appeared an image celebrating the October 24, 1861 inauguration of the first transcontinental telegraph line. Although the illustration was published with no accompanying article, given the context of the rest of the magazine—devoted almost exclusively to reportage of the progress of the Civil War that had broken out in the USA earlier that year—it would be hard not to hear a political resonance in the words, “perpetual union.” Indeed, the very first telegram transmitted on the new line testified directly to this resonance. Addressed to President Lincoln in Washington, D.C., the telegram spoke of Californians’ “loyalty to the Union and their determination to stand by the government on this, its day of trial.” This was a pledge of allegiance, not only in response to what had already become a devastating war of partition, but also in support of a grand project of technological modernization: the engineering of a new physical and social world in which the most remote hinterlands would be linked directly to the deepest heartlands of government, industry, and culture. Even more profoundly than the postal system and print industries that preceded it, the electromagnetic telegraph invoked a coming age of free exchange and virtual tele-presence. This new vision of wired nations and unchained spirits is dramatically depicted by the image of an angel, moving as lithely as a tight-rope walker along the telegraph wire, her wings folded in wait for an even more effortless journey to come. By the time its cables had reached the Pacific Coast, the telegraph had already come to occupy a prime place in the American imaginary, providing (among many other things) a metonym for what Catherine Albanese has called the “kinetic revolution” that was placing new priorities on motion, transformation, and progress in all facets of civil, cultural, economic and political life in the Jacksonian era. Alongside the extension of roads, bridges and tunnels across even the most mountainous terrains, the expansion of the railway system, and increasing opportunities for travel by steam-powered watercraft, the telegraph engendered a new, vertiginous experience of “life in the fast lane” and the collapsing of distant horizons through the universal and invisible, but very tangible medium of electricity. Long before Google, Second Life, or the Web 2.0, telegraphy was implicated in the creation of phantasmatic, electrically-mediated communities of knowledge-seekers, conversation partners, and like-minded souls dispersed across the entire globe. The very first message to reach California on that inaugural day of the new transcontinental line came from Brigham Young, the Mormon leader, governor of Utah, and patron of Western settlement, who rejoiced in the telegraphic strengthening of “the bonds of friendship between the people of Utah and the people of California,” but who ended his salutation with an injunction that pointed to the work to come: “Join your wires with the Russian Empire, and we will converse with Europe.” The Pacific Coast was already no longer visualized as the end of the line. At the very moment of completion of the American transcontinental line, the telegraph’s horizon was extended further, pointing toward an imminent, truly global, frontier-less, and harmonized future. Observing the anxious and inquiring expression on the faces of those who had managed to get near enough to thrust their heads through the open window, it occurred to me to act in a very mysterious manner in order to see what effect it would have upon my spectators. … [As] I was preparing the message for transmission … instead of handing it to the boy for delivery, I put it, holding it in my hand, under the table, which was provided with sides sufficiently deep to hide the envelope from their view. As I did this I kept my eyes fixed on the wire, while, with my right hand, I took hold of the key and began working it. The moment the crowd heard the first click of the instrument they all rushed from under the veranda out into the street to see the message in the envelope pass along the wire. On seeing them rush out tumbling one over the other to catch a glimpse of the message, we on the inside burst out into one long and continued roar of laughter. … The telegraph was to them the very hardest kind of a conundrum. It was impossible of solution. Their final conclusion was that it was an enchained spirit—but whether a good one or an evil one they could not quite determine—over which I had such control that it was obliged to do my bidding. Under this impression they departed one by one, looking upon both the telegraph and myself as something, as the Scotchman would say, ‘uncanny’. was told that when the telegraph was completed he could talk to [his distantly located wife] as well from there as if by her side; but this was more than his comprehension could seize. Talk to her when nearly three hundred miles away! No; that was not possible. He shook his head, saying he would rather talk to her in the old way. His idea of the telegraph was that it was an animal, and he wished to know on what it fed. They told him it ate lightning; but, as he had never seen any one make a supper of lightning, he was not disposed to believe that. presented me with a daguerreotype of himself in full dress, taken in Salt Lake several years before, begging me to receive it as a mark of his appreciation of the kindness I had manifested toward him. This was accompanied by the request that on my return home I would send him a portrait of myself. I promised to do so, and on arriving in San Francisco had myself photographed … [and then] placed [the picture] in a gold double locket, with a chain, so that it could be worn around the neck, and forwarded it to him through the Indian Agent, who afterward presented it to Sho-kup with great ceremony. In this exchange, which of the actors is “the primitive” and which is “the modern?” Perhaps an answer can be found by taking stock of the remarkable collection of material, technological, and phantasmatic entities populating Gamble’s narrative: telegraph operating instruments; invisible flows of electricity; sleights of hand; superstitious minds; enchained spirits; monstrous, metallic animals that live on a diet of lightning; and photographs destined to serve as talismans, yoking their wearers into bonds of distant friendship and strategic alliances. It is hardly insignificant that most of these magical forces were mobilized not by Gamble’s putatively gullible audiences or by the primitives he encountered along his journey, but by Gamble himself. By projecting the presence of spirits, assigning magical explanations, and offering supernatural gifts, Gamble had joined the ranks of what was emerging–not only in the USA—as an advancing army of proselyte-engineers, whose mission was to expand and secure general acceptance for the telegraph through the promulgation of magic. Like the Biblical Aaron beating the Pharaoh’s magicians at their own game, the protagonists of telegraphic modernity forged consensus for their project through the creation of “better,” “more impressive” magic.